On Wall Street, the Dow Jones sinks 178 points amid rising tensions in Mideast. Libyan leader Col. Moammar Gadhafi publicly defied protesters seeking to end his rule, vowing to remain in the country "until the end" in a televised speech where he said he is prepared to die as a "martyr" rather than leave. Mixed retailer earnings and another depressing read on housing didn’t help sentiment. Despite a strong Feb consumer confidence index, the Dow plunged 1.4% to 12213, as Libya's escalating political crisis sparked a sharp sell-off in Wall Street and spurred concern that heightened Mideast geopolitical risks will drive oil prices higher and stoke global economic recovery. The price of oil is entering a “dangerous zone” that threatens global economic growth, according to Fatih Birol, chief economist at the International Energy Agency (IEA). Conditions in the Middle East and North Africa are “very important from the point of view of oil supply and demand, not only for the next few weeks, but looking from a longer perspective,” Birol said. The International Energy Agency (IEA) estimates that “in the next 10 years, 90% of the growth in global oil production needs to come from Middle East and North African countries,” he added. Sentiment was also weighed down by a disappointing Wal-Mart retail sales numbers. After the close, shares of HP were down 7.3% to $45.10 after offering lower-than-expected guidance. 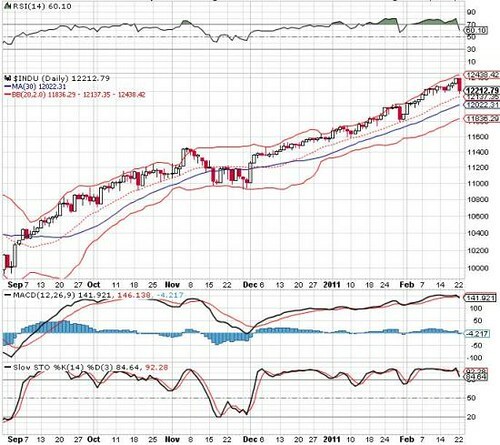 Immediate Supports For Dow Jones Is At Mid Bollinger Band & 30-Days SMA.